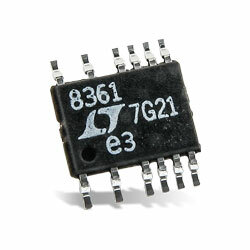 The Analog Devices LT8361 Low IQ Boost/SEPIC/Inverting Converters are current-mode, 2MHz multi-topology DC-DC converters with a 2A, 100V power switch. Creators can configure the devices as either a boost, SEPIC, or an inverting converter. The 375mOhm power switch allows the device to deliver operational efficiencies up to 95%. The converters work from an input voltage range of 2.8V to 60V and have a programmable switching frequency from 300kHz to 2MHz. For increased efficiency, a BIAS pin can receive a second input to supply the INTVCC regulator. An external compensation pin enables optimisation of loop bandwidth over a broad range of input and output voltages. The SYNC/MODE pin provides synchronisation of the device to an external clock. Also, the SYNC/MODE pin can be used to choose between burst or pulse-skip modes of operation with or without Spread Spectrum Frequency Modulation for low EMI. In burst-mode operation, the device uses as little as 9µA quiescent current to maintain over 90% efficiency at very low output currents, while maintaining typical output ripple below 15mV. Provided in a thermally enhanced 16-Lead MSOP package, the device is ideal for applications with input sources ranging from a single-cell Li-Ion battery to multi-cell battery stacks, telecom power supplies, automotive inputs, and industrial power rails.